During an ongoing research the water retention curves of three sand fractions and 12 continuous and gap-graded two component sand mixtures with various composition ratio is measured. Due to the unexpectedly long equalization times in the low suction range complete data sets are not available yet. The existing data were used to test the newly set up sand box, an a priori water retention curve model, the van Genuchten double and the Fredlund–Xing models. Comparing the old and the new SWCC measuring boxes, first results indicate a constant bias between the measured retention data. The existing data partly support the a priori model and indicate that the present grading curve determination method is not sophisticated enough. According to the results of the model fitting, the van Genuchten model is slightly better than the Fredlund–Xing model. The model fit was better to the newly measured short data set than the fit to the whole SWCC data of similar sand mixtures. 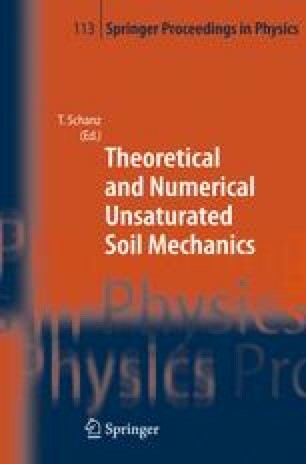 The van Genuchten permeability function indicated a more rapid permeability decrease for the finer grain size than the coarser soils explaining the experienced very long equalization times.